I S Bindra was the one man who stood up for Lalit Modi, Sunil Gavaskar was largely quiet and BCCI president Shashank Manohar led the charge against the former IPL boss. NDTV has exclusive details of what happened at the closed-door IPL governing council meeting on Monday as the important men of cricket met to decide on Modi's fate and that of the Indian Premier League. Sources said of the 12 members present, only Punjab Cricket Association president IS Bindra defended Modi. Bindra repeatedly questioned Modi's suspension. IPL governing council member Sunil Gavaskar chose not to voice his opinion, staying mostly silent at the meeting, sources said. But fellow members Ravi Shastri and Mansoor Ali Khan Pataudi were outspoken, the sources said, with Pataudi raising questions about Modi's complicated negotiation of the telecast rights for IPL matches for which an 80-million-dollar facilitation fee was paid by Multi-Screen Media (MSM) to World Sports Group (WSG), which held the global broadcast rights. The sources said Manohar, BCCI secretary N Srinivasan and Delhi cricket association chief Arun Jaitley said charges against Modi were non-negotiable. IPL vice-chairman Niranjan Shah went along with them. MP Pandove and Farooq Abdullah, both of whom have been ambivalent in their stance, were not present at the meeting, the sources said. The governing council appointed Chirayu Amin as interim chief of the IPL. 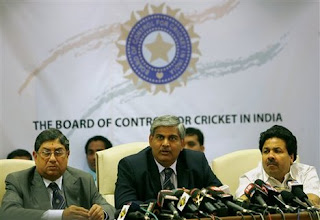 Amin is BCCI vice president and the head of the Baroda Cricket Association. This after it was proposed that Shashank Manohar head the IPL. That proposal was shot down by the BCCI president himself.